The British Campaign in France. Chapter XV. The Battle of Loos (continued) is the 15th article, published in june 1917, in a series of 21 articles written by Arthur Conan Doyle serialized in The Strand Magazine. 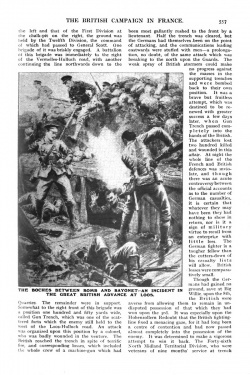 The Boches between bomb and bayonet — an incident in the great British advance at Loos. 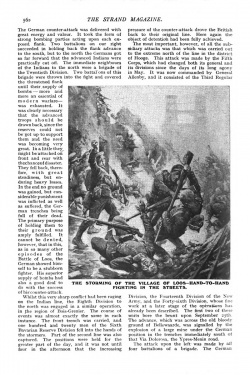 The storming of the village of Loos — hand-to-hand fighting in the streets. Mixed Fighting — The Great Counter-Attack — Attack of the Forty-sixth Division — Subsidiary Attacks — Results — Coming of Winter — Change of Command. Whilst these operations had been carried on upon the left half of the field of battle, to the north of the bisecting road, the Twelfth Division, a fine South of England unit of the new Army, had moved forward into the space to the right of the road, taking over the trenches held by the Guards, and connecting up with the French at Loos. Save in the sector occupied by the Twenty-eighth Division, the action had died down, and the British, aided partly by those pioneer battalions which had been formed out of ordinary infantry regiments to do work usually assigned to the sappers, strengthened their hold upon the ground that they had won, in the sure conviction that they would soon have to defend it. The shell-fire continued to be heavy upon both sides, and in the course of it General Wing, of the Twelfth Division, was unfortunately killed, being struck by a shell outside his divisional headquarters. He had been one of the artillery officers who had most to do with the fine handling of the guns of the Second Corps at Le Cateau, and was a very rising soldier of the most modern sort. Three divisional generals killed — Capper, Wing, and Thesiger — such losses in the higher ranks are hardly to be matched in our history. To match them one has to go back a hundred years to that supreme day when Picton, De Lancy, Ponsonby, and so many others died in front of their troops upon the historic plateau of Waterloo. On October 1st at eight in the evening Bulfin's men were hard at work once more. It will be remembered that the Little Willie Trench had been plugged at the southern end three days before. The Germans still held the main line of it, but could not get down it into the Hohenzollern Redoubt. It was now charged most brilliantly and carried, but after holding it for a day its captors lost so heavily that they were compelled to resume their old position once more. A second battalion tried to win the ground back, but without success. Upon the afternoon of Sunday, October 3rd, the fighting, which had died down, broke out once more. The line at this date was formed by the Ninth French Corps, our splendid comrades of Ypres, upon the right, occupying Loos and that portion of the slopes of Hill 70 which had remained in our hands. On their left was the Twelfth British Division up to the Vermelles-Hulluch road, -and to their left Bulfin's Twenty-eighth Division holding the northern area, including the Hohenzollern Redoubt. For several days the bombing parties of the enemy had been eating their way into this fortress, and upon the 3rd the greater part of it reverted into their hands. These attacks were based upon their strong positions in the north, supported by the machine-guns of Fosse 8 and the heavy artillery of Auchy. On the same day a strong force advanced against the right of the Twenty-eighth Division between the Quarries and the Vermelles-Hulluch road, but this attack was repulsed with heavy loss. On October 4th and 5th the Twenty-eighth Division was withdrawn, and the Guards, after three days' rest, were called upon once more; one brigade taking its position at the section of the Hohenzollern Redoubt which we held, while another was on their right, and the third in reserve at Vermelles. At the same time, the First Division moved to the front on the right of the Guards, reinforcing the Twelfth Division. All these troops were keenly alive to the fact that the Germans were unlikely to sit down under their defeat, and that the pause was only the preliminary to a great counter-attack. All efforts were therefore made to consolidate the ground. The expectations were fulfilled, for upon October 8th the enemy brought up their reserves from far and near, determined to have back the ground that they had lost. The British and French were no less inexorable in their grip of that which had cost them so much to win. It is the attacker in modern warfare who pays the price. Sometimes he gets the value of his blood, sometimes he pays it freely and gets nothing whatever in exchange. So it was in this instance. Along the whole long curve of the defence, from the southern trenches of the Hohenzollern Redoubt in the north to the French position in the south, the roar of the battle went up. On the left of the French was the First Division, on their left the Twelfth, on theirs the Guards, on theirs the Seventh Division, stout fighters all. The Germans rushed on boldly, swarms of bombers in front, lines of supporting infantry behind. Everywhere they were cut down and brought to a stand by the sleet of bullets. It was the British machine-gunner who now crouched under cover and spread death fanwise before him, while it was the German infantryman who rushed and tripped and rose and fell in the desperate effort to do that which is impossible. All honour to him for the valour of his attempt. To appreciate the nature of a great deal of this fighting one must remember that the whole scene of it was intersected by a perfect maze of trenches which belonged to the original German third line of defence, and were therefore familiar to them while they were strange to those British troops who now occupied them. All along these zigzag lines the two parties were only from thirty to fifty yards apart, so that the broad, deserted plain was really intersected with narrow runways of desperately active life. Attacks developed in an instant. bombing parties sprang forward at any moment, rifles were used at point-blank range, so that an exposed bayonet was often snapped off by a bullet. Close to the bombers' keep fifty small bayonet periscopes, four bayonets, and five foresights of rifles were shot off in an hour and a half. Over traverses men pelted each other with anything that was deadly, while above their heads the great shells for ever screamed and rumbled. A great effort was made against the trench called Big Willie, running out from the Hohenzollern Redoubt, which had been taken over by the Guards. In the afternoon of the 8th, after a heavy bombardment which had flailed the position for four hours, there was a determined rush of bombers upon these trenches, the Germans, our old friends of the Seventh Westphalian Corps, coming on in three battalions, each of them down a different communication trench. The general direction of the attack was from the north and east. The trenches assaulted were held by two, brigades of Guards. both of which were heavily engaged. The riflemen, however, were useless, as only a bomber can meet a bomber. At first the stormers had some success, for pushing along very valiantly and with great technical precision they broke into one section of trench, putting out of action all the bombers and machine-gunners. The officer in command called, however, for bombers, who swept down the trench, pelted the Germans out of it, and gloriously avenged the prostrate riflemen. Another battalion of Guards had been driven back and their bomb-store was temporarily captured, but they came back and regained it after some stark face-to-face fighting, in which a sergeant won his V.C. The Guards lost a hundred men in this action, many of them blown to pieces by the bombs, but they cleared most of the trenches, though a portion of Big Willie remained in German hands. The fight lasted for two hours and a half, in the course of which nine thousand bombs were thrown by the British. Another focus of strife upon October 8th was the chalk-pit upon the Lens-Hulluch road. that tragic spot which had seen in turn the advance of the Fifteenth Division, of the Twenty-first, and of the Guards. It had now been taken over by the First Division, who had, as already mentioned, come back into the line after a rest. Across that road of death, the Loos-Hulluch highway, lay the ill-omened Bois Hugo, which offered a screen for the German advance. Six battalions were attacking, and as many more on the line held by the French. Here the Germans loft very heavily, going clown in heaps before the rifle-fire of the battalions in the First Division firing-line. The French 75's had been equally deadly and successful. Between the position held by the Guards near the Hohenzollern Redoubt on the left and that of the First Division at the chalk-pit on the right, the ground was held by the Twelfth Division, the command of which had passed to General Scott. One brigade of it was briskly engaged. A battalion of this brigade was immediately to the right of the Vermelles-Hulluch road, with another continuing the line northwards down to the Quarries. The remainder were in support. Somewhat to the right front of this brigade was a position one hundred and fifty yards wide, called Gun Trench, which was one of the scattered forts which the enemy still held to the west of the Loos-Hulluch road. An attack was organized upon this position by a colonel, who was badly wounded in the venture. The British reached the trench in spite of terrific fire, and corresponding losses, which included the whole crew of a machine-gun which had been most gallantly rushed to the front by a lieutenant. Half the trench was cleared, but the Germans had themselves, been on the point of attacking, and the communications leading eastwards were stuffed with men — a prolongation, no doubt, of the same attack which was breaking to the north upon the Guards. 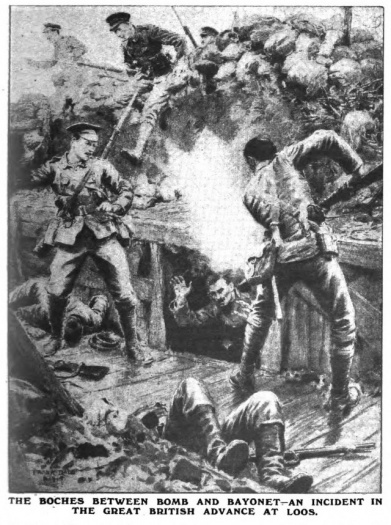 The weak-spray of British stormers could make no progress against the masses in the supporting trenches and were bombed back to their own position. It was a brave but fruitless attempt, which was destined to be renewed with greater success a few days later, when Gun Trench passed completely into the hands of the British. The attackers lost two hundred killed and wounded in this affair. 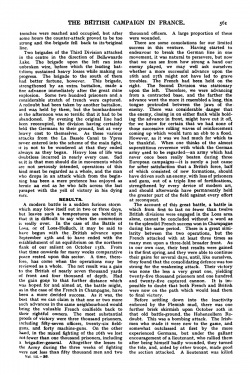 At night the whole line of the French and British defences was inviolate, and though there was an acute controversy between the official accounts as to the number of German casualties, it is certain that whatever they may have been they had nothing to show in return, nor is it a sign of military virtue to recoil from an enterprise with little loss. The German fighter is a tougher fellow than the cutters-down of his casualty lists will allow. British losses were comparatively small. Though the Germans had gained no ground, save at. Big Willie, upon the 8th, the British were averse from allowing them to remain in undisputed possession of that which they had won upon the 3rd, It was especially upon the Hohenzollern Redoubt that the British fighting-line fixed a menacing gaze, for it had long been a centre of contention and had now passed almost completely into the possession of the enemy. It was determined to make a vigorous attempt to win it back. The Forty-sixth North Midland Territorial Division, who were veterans of nine months' service at trench warfare, but had not yet been heavily engaged, were brought up from the rear, and upon October 12th they relieved the Guards' Division on the left of the front line. At the same time it was planned that there should be an attack by the First Division to the west of Hulluch, and another by the Twelfth Division in the region of the Quarries. Of these we shall first describe the attack of the Territorials upon the Hohenzollern Redoubt and Fosse 8. On October 13th, at noon, a severe bombardment was opened which concentrated upon the enclosure of the redoubt, and the space between that and Fosse 8. An hour later there was an emission of gas, borne by a brisk breeze towards the German trenches, and later still a smoke-cloud was sent out to cover the advance. This bombardment does not seem for some reason to have been effective, and even while it went on the sniping and machine-guns were active in the enemy line. At two o'clock the troops dashed over the parapet, the men with that light-hearted courage which is so intolerable to the heavier German spirit, singing, "Here we are, here we are, here we are again!" as they vaulted out of their trenches. The advance was splendidly executed and won the critical admiration of some of the Guards who were privileged to see it. In the face of a murderous fire the attacking line swept, in an order which was only broken by the fall of stricken men, up to the front-line trench, two hundred yards in front. Here, however, the attack was held up by an overwhelming fire. The gallant survivors succeeded in getting as far as a communication trench which led to Big Willie, and held on there. The advance of the men upon the right was conditional upon the success of their comrades to the left. The officer commanding the left companies saw that little progress had been made and exercised his discretion in holding back his men. 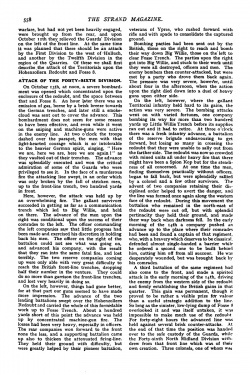 The officer on the right of the battalion could not see what was going on, and advanced his company, with the result that they ran into the same fatal fire, and lost terribly. The two reserve companies coming up were only able with very great difficulty to reach the British front-line trenches, dropping half their number in the venture. They could do no more than garrison the front-line trenches, and lost very heavily in doing so. On the left, however, things had gone better, for at that part our guns seemed to have made more impression. The advance of the two leading battalions swept over the Hohenzollern Redoubt and carried the whole of this formidable work up to Fosse Trench. About a hundred yards short of this point the advance was held up by concentrated machine-gun fire. The losses had been very heavy, especially in officers. The rear companies won forward to the front none the less, and a supporting battalion came up also to thicken the attenuated firing-line. They held their ground with difficulty, but were greatly helped by their pioneer battalion, veterans of Ypres, who rushed forward with rifle and with spade to consolidate the captured ground. Bombing patties had been sent out by the British, those on the right to reach and bomb their way down Big Willie, those on the left to clear Fosse Trench. The parties upon the right got into Big Willie, and stuck to their work until they were all destroyed, officers and men. The enemy bombers then counter-attacked, but were met by a party who drove them back again. The pressure was very severe, however, until about four in the afternoon, when the action upon the right died down into a duel of heavy guns upon either side. On the left, however, where the gallant Territorial infantry held hard to its gains, the action was very severe. The bombing attacks went on with varied fortunes, one company bombing its way for more than two hundred yards up Little Willie Trench before its supplies ran out and it had to retire. At three o'clock there was a fresh infantry advance, a battalion of the reserve brigade endeavouring to get forward, but losing so many in crossing the redoubt that they were unable to sally out from the farther side. The redoubt was now so crowded with mixed units all under heavy fire that there might have been a Spion Kop but for the steadiness of all concerned. At one time the men, finding themselves practically without officers, began to fall back, but were splendidly rallied by a colonel and a few other survivors. The advent of two companies retaining their disciplined order helped to avert the danger, and the line was formed once again along the western face of the redoubt. During this movement the battalion who remained in the north-east of the redoubt were cut off, but with splendid pertinacity they held their ground, and made their way back when darkness fell. In the early morning of the 14th a company pushed an advance up to the place where their comrades had been and found a captain of that regiment, who, with a bravery which deserves to be classical, defended almost single-handed a barrier while he ordered a second one to be built behind him, cutting him off from all succour. He was desperately wounded, but was brought back by his comrades. A third battalion of the same regiment had also come to the front, and made a spirited attack in the early morning of the 14th, driving the enemy from the western side of the redoubt and firmly establishing the British gains in that quarter. This gain was permanent, though it proved to be rather a visible prize for valour than a useful strategic addition to the line. So long as the sinister, low-lying dump of Fosse 8 overlooked it and was itself untaken, it was impossible to make much use of the redoubt For forty-eight hours the advanced line was held against several brisk counter-attacks. At the end of that time the position was handed over to the safe custody of the Guards, while the Forty-sixth North Midland Division withdrew from that front line which was of their own creation. Three colonels, one of whom was shot through the knee, but refused to move until he saw the result of the attack, and over four thousand officers and men were among the casualties during the forty-eight hours of exposure. The action was a very desperate one, and nothing could have been finer than the conduct of all engaged. "It was not the actual advance; but the holding of the position afterwards, that was dreaded." So wrote one of the combatants. In fact, the Germans proved to be very numerous and aggressive, and there can be little doubt that at this period their bombers had a technical proficiency which was superior to our own, whether their opponents were Guards or Territorials. It is characteristic of the unique warfare that now prevailed that each of the contending parties had practically abandoned rifles, save as so many pikes, and that each man carried a pouch full of projectiles, the size of a duck's egg, and capable of disabling a dozen in a single burst. It may be added that both sides wore leathern helmets, sometimes with the visors up and sometimes with the face entirely concealed, so that it appeared to be a murderous strife of the strange, goggle-eyed, mask-faced creatures of a nightmare. Such were the extraordinary products of modern European warfare. Could all the ground taken have been permanently held this would have been a fine little victory. So constant has been the phenomenon that the extreme point cannot be held that it could now be stated as an axiom for either side, and seemed to suggest that the methods of attack should be in some way modified. Each successive line of resistance has decreased the momentum of the stormers and has helped to lessen their store of bombs, while the farther they have advanced the more difficult it is for fresh men or supplies to reach them. Then, again, their diminished numbers have caused a contraction and bunching of the line, so enabling the counter-attack to get round their flanks. Add to this the physical exhaustion caused by extreme exertions while carrying a considerable weight, and one has the factors which always produce the same result, and which led eventually to the more fruitful tactics of the limited objective. When the Forty-sixth Midland Division advanced upon the Hohenzollern Redoubt upon October 13th, there was a brisk attack also by the Twelfth Division upon their right, and by the First Division on the right of the Twelfth. In the case of the Twelfth Division two brigades were heavily engaged. One battalion carried and permanently held the Gun Trench, a position which had cost the same brigade the lives of many officers and men upon the 8th. 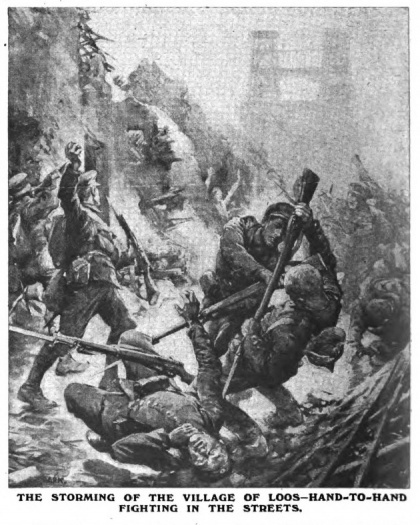 Attacking farther to the left, a second battalion was caught by machine-gun fire and lost heavily. Of three companies who went out, all much under strength, eleven officers and four hundred men were left upon the ground, and a photograph has revealed the perfect alignment of the dead. At the same hour the First Division, with a smoke and gas screen before them, had broken in upon the German lines to the south-west of Hulluch, near the Hulluch-Lens road. About a thousand yards of trenches were taken, but the shell-fire was so murderous that it was found to be impossible to retain them. The attack was urged by Territorials upon the left, New Army men in the centre, and Regulars upon the right, and at all points it was equally gallant. The operations at the main seat of action, the Loos sector, have been treated continuously in order to make a consecutive narrative, but we must now return to consider the subsidiary attacks along the line upon September 25th. While the First and Fourth Corps, supported by the Eleventh, had been delivering this great attack between La Bassée and Grenay, a series of holding actions had been fought from the coast downwards, so as to pin the Germans as far as possible to their places. Some of these attacks were little more than demonstrations, while others in less serious times would have appeared to be considerable engagements. The Second Regular Division, acting upon the extreme left of the main attack, was astride of the La Bassée Canal. The most northern brigade was opposite to Givenchy, and its advance seems to have been intended rather as a distraction than as a serious effort. It took place half an hour or so before the general attack, in the hope of misleading them as to the British plans. At the signal the three leading battalions dashed forward and carried the trench line which faced them. The attack was unable to make any further progress, but the fight was sustained for several hours and had the desired effect of occupying the local forces of the enemy and preventing them from detaching reinforcements to the south. The same remark would apply to a forward movement of a brigade of the Nineteenth Division to the immediate north of Givenchy. Two battalions sustained heavy losses, but sacrificed themselves, as so many others were obliged to do, in keeping up the appearance of an attack which was never seriously intended. Taking the subsidiary attacks from the south upwards, we come next to that of the Indians in the vicinity of Neuve Chapelle. This was a very brilliant affair, carried out with the true Indian tiger-spring. Had it been possible to support by adequate reserves of men and an unrestricted gun-fire, it had in it the possibility of a fine victory. The attack was carried out by the Meerut Division. The brigade on the right were partly held up by wire, but that on the left came through everything and swept into the front-line trenches, taking two hundred unwounded prisoners of the Seventh Westphalian Corps. Supporting troops thickened the attack, and they swept forward into the second-line trenches, which they also cleared. They were now half a mile within the enemy's position, and both their flanks were open to attack. The reserve brigade was hurried up, but the trenches were blocked with wounded and prisoners, so that progress was very difficult. The German counter-attack was delivered with great energy and valour. It took the form of strong bombing parties acting upon each exposed flank. Two battalions on our right succeeded in holding back the flank advance to the south, but to the north the Germans got so far forward, that the advanced Indians were practically cut off. The immediate neighbours of the Indians to the north were a brigade of the Twentieth Division. Two battalions of this brigade were thrown into the fight and covered the threatened flank until their supply of bombs — more and more an essential of modern warfare — was exhausted. It was clearly necessary that the advanced troops should be drawn back, since the reserves could not begot up to support them and the need was becoming very great. In a little they might be attacked on front and rear with the chance of disaster. They fell back, therefore, with great steadiness, but enduring heavy losses. In the end no ground was gained, but considerable punishment was inflicted as well as suffered, the German trenches being full of their dead. The primary purpose of holding them to their ground was amply fulfilled. It cannot be denied, however, that in this, as in so many other episodes of the Battle of Loos. the German showed himself to be a stubborn fighter. His superior supply of bombs had also a good deal to do with the success of his counter-attack. Whilst this very sharp conflict had been raging on the Indian line, the Eighth Division to the north was engaged in a similar operation, in the region of Bois-Grenier. The course of events was almost exactly the same in each instance. The front trench was carried, and one hundred and twenty men of the Sixth Bavarian Reserve Division fell into the hands of the stormers. Part of the second line was also captured. The positions were held for the greater part of the day, and it was not until four in the afternoon that the increasing pressure of the counter-attack drove the British back to their original line. Here again the object of detention had been fully achieved. The most important, however, of all the subsidiary attacks was that which was carried out to the extreme north of the line in the district of Hooge. This attack was made by the Fifth Corps, which had changed both its general and its divisions since the days of its long agony in May. It was now commanded by General Allenby, and it consisted of the Third Regular Division, the Fourteenth Division of the New Army, and the Forty-sixth Division, whose fine work at a later stage of the operations has already been described. The first two of these units bore the brunt upon September 25th. The advance, which was across the old bloody ground of Bellewaarde, was signalled by the explosion of a large mine under the German position in the trenches immediately south of that Via Dolorosa, the Ypres-Menin road. The attack upon the left was made by all four battalions of a brigade. The German trenches were reached and occupied, but after some hours the counter-attack proved to be too strong and the brigade fell back to its original line. Two brigades of the Third Division attacked in the centre in the direction of Bellewaarde Lake. The brigade upon the left ran into unbroken wire, before which the leading battalions sustained heavy losses while making no progress. The brigade to the south of them had better fortune, however. This brigade, strengthened by an extra battalion, made a fine advance immediately after the great mine explosion. Some two hundred prisoners and a considerable stretch of trench were captured. 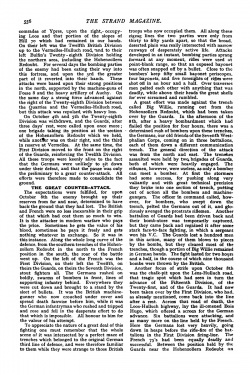 A redoubt had been taken by another battalion, and was held by them, but the bombardment in the afternoon was so terrific that it had to be abandoned. By evening the original line had been reoccupied, the division having certainly held the Germans to their ground, but at very heavy cost to themselves. As these various attacks from the La Bassée Canal to Ypres never entered into the scheme of the main fight, It is not to be wondered at that they ended always as they began. Heavy loss of life was doubtless incurred in nearly every case. Sad as, it is that men should die in movements which are not seriously intended, operations of this kind must be regarded as a whole, and the man who drops in an attack which from the beginning has been a mere pretence has enjoyed as heroic an end as he who falls across the last parapet with the yell of victory in his dying ears. A modern battle is a sudden furious storm which may blow itself out in two or three days, but leaves such a tempestuous sea behind it that it is difficult to say when the commotion is really over. In the case of the Battle of Loos, or of Loos-Hulluch, it may be said to have begun with the British advance upon September 25th and to have ended with the establishment of an equilibrium on the northern flank of our salient on October 13th. From that time onwards for many weeks comparative peace rested upon this sector. A time, therefore, has come when the operations may be reviewed as a whole. The net result was a gain to the British of nearly seven thousand yards of front and four thousand of depth. Had the gain gone to that further distance which was hoped for and aimed at, the battle might, as in the case of the French in Champagne, have been a more decided success. As it was, the best that we can claim is that one or two more such advances in the same neighbourhood would bring the valuable French coalfields back to their rightful owners. The most substantial proofs of victory were three thousand prisoners, including fifty-seven officers, twenty-six field-guns, and forty machine-guns. On the other hand, in the mixed fighting of the 26th we lost not fewer than one thousand prisoners, including a brigadier-general. Altogether the losses to the Army during the three weeks of fighting Were not less than fifty thousand men and two thousand officers. A large proportion of these were wounded. There are some consolations for our limited success in this venture. Having started to endeavour to break the German line in one movement, it was natural to persevere, but now that we can see from how strong a hand our enemy played, we may well ask ourselves whether a more successful advance upon the 26th and 27th might not have led to grave troubles. The French had been held on the right. The Second Division was stationary upon the left. Therefore, we were advancing from a contracted base, and the farther the advance went the more it resembled a long, thin tongue protruded between the jaws of the enemy. There was considerable danger that the enemy, closing in on either flank while holding the advance in front, might have cut it off, for we know for certain, that we had none of those successive rolling waves of reinforcement coming up which would turn an ebb to a flood. However, as it was we had much for which to be thankful. When one thinks of the almost superstitious reverence with which the German army used to be regarded—an army which had never once been really beaten during three European campaigns — it is surely a just cause for sober satisfaction that a British force, half of which consisted of new formations, should have driven such an enemy, with loss of prisoners and guns, out of a triple line of fortifications, strengthened by every device of modern art, and should afterwards have permanently held the greater part of the field against every effort at reconquest. 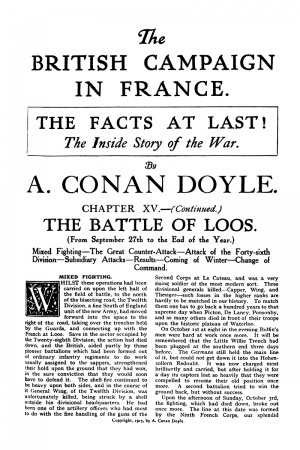 The account of this great battle, a battle in which from first to last no fewer than twelve British divisions were engaged in the Loos area alone, cannot be concluded without a word as to the splendid French success won in Champagne during the same period. There is a great similarity between the two operations, but the French attacked with at least three times as many men upon a three-fold broader front. As in our own case, their best results were gained in the first spring, and they were able to continue their gains for several days, until, like ourselves, they found that the consolidating defence was too strong for the weakening attack. Their victory was none the less a very great one, yielding twenty-five thousand prisoners and one hundred and twenty-five captured cannon. It is impossible to doubt that both French and British were now on the path which would lead them to final victory. Before settling down into the inactivity enforced by the Flemish mud, there was one further brisk skirmish upon October 20th in that old battle-ground, the Hohenzollern Redoubt. This was a bombing attack. The Irishmen who made it were new to the game, and somewhat outclassed at first by the more experienced Germans, but under the gallant encouragement of a lieutenant, who rallied them after being himself badly wounded, they turned the tide, and, aided by other troops, made good the section attacked. A lieutenant was killed and sixty men killed or wounded in this brisk encounter. So, for a second time, wet, foggy winter. settled down upon the water-logged, clay-bottomed trenches. Little did those who had manned them at Christmas of 1914 imagine that Christmas of 1915 would find them in the same position. Even their brave hearts would have sunk at the thought. And yet a move back of a couple of miles at Ypres, and a move forward of the same extent in the south, was all that either side could show for a year's hard work and the loss of so many thousand lives. Bloch, the military prophet of 098, had indeed been justified of his wisdom. .Far off, where armies could move, the year had seen great fluctuations. The Russians had been pushed out of Poland and far over their own borders. Serbia had been overrun. Montenegro was on the verge of utter destruction. The great attempt upon the Dardanelles had been made and had failed, after an epic of heroism which will surely live for ever in our history and in that of our brave Australian and New Zealand brothers. In our Arabian Nights campaign we had advanced in Mesopotamia to within sight of the minarets of Bagdad and had fought a battle round the ruined palace, of Darius, but yet again. we had been compelled to leave our task unfinished. The one new gleam of light in the whole year had been the adhesion of Italy to the cause of Freedom. And yet, though nearly every detail had been adverse to us, our deepest instincts told us that the stream did in truth move with us, however great and confusing might be the surface current. Here on the long western line, motionless, but not passive, locked in a vast strain which grew ever more tense, was the real war. All others were subsidiary. And here in this real war, the one theatre where decisive results could be looked for, our position was very different in the opening of 1916 to that which 1915 had shown us. In the year the actual army in France had grown three and four-fold. The munitions had increased in far greater proportions. The days bad gone for ever when a serious action meant three: months. of shell economy before the fight and three months of recuperation after it. To the gunners it was like an evil dream to look back to the days when three shots per day was the allowance, and never save on a definite target. Now, thanks to the driving power of Lloyd George and his admirable band of assistants, there. would never, again be a dearth, and no attack should ever languish for want of the means to follow it up. Our guns, too, were clustering ever more thickly and looming ever larger. Machine-guns Wee pouring forth, though there, perhaps, we had not yet overtaken our enemy. Above all, our Fleet still held the seas, the cry of distress from within Germany rose ever shriller, and it was certain that the sufferings which she had so wantonly and wickedly inflicted upon others were beginning to be repaid to her. "Gott" does indeed "straf," and needs no invocation, but now, as always, it is on the guilty that the rod falls. One event had occurred in the latter end of the year which cannot be. allowed to pass with-out comment. This was the retirement of Sir John French, and his return as Lord French to take command of the home forces. It is a difficult matter to get the true proportion, either of events or of characters, in so great an epoch as this. It will be years before the true scale will gradually be found. At the same time it can be said now with absolute certainty that the name of John French will go down to history for the sterling work that he has done during sixteen months of extreme military pressure. Nothing which the future could bring, however terrific our task, could be charged with the same possibilities of absolute disaster as those operations of the past through which he and his brilliant subordinates had successfully brought the Army. 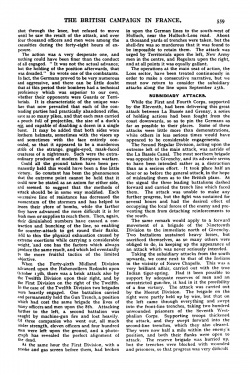 His was the preparation of the troops before the campaign, his the responsibilities of mobilization, and his the primary credit that they were in the fighting-line by August 22nd, 1914 — they who, upon August 4th, had been scattered, without their reserves or full equipment, over a dozen garrison towns. This alone was a great feat. Then came the long, desperate fight to make head against a superior foe, the rally, the return, the fine change of position, the desperate 'struggle for the coast, the. victory saddened by the practical annihilation of the old Regular Army, the absorption. and organization of the new-elements, the resumption .of the offensive, and that series of spirited actions which, if they never attained full success, were each more formidable than ,the last, and were all Preparatory exercises for the great Somme battles of 1916. This was the record which Lord French took back with him to. the Horse Guards, and it is one which can never be forgotten by his fellow countrymen. Sir Douglas Haig, who succeeded to the chief command, was the leader who would undoubtedly have been called to the vacant post by both Army and public had leaders been chosen in the old Pretorian fashion. 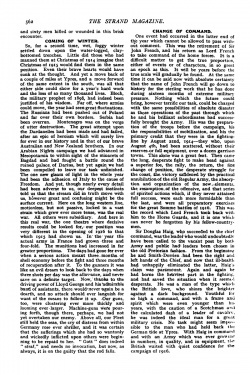 From the beginning he and Smith-Dorrien had been the right and left hands of the Chief, and now that ill-health had unhappily eliminated the latter, Haig's claim was paramount. Again and again he had borne the heaviest part in the fighting, and had saved – the situation when it seemed desperate. He was a man of the type which the British love, who shines the brighter against a dark background. Youthful for so high a command, and with a frame anti spirit which were even younger than his years, with the caution of a Scotchman and the calculated dash of a leader of cavalry, he was indeed the ideal man for a great military crisis. No task might seem impossible to the man who had held back the German tide at Ypres. With Haig in command and with an Army which was ever growing in numbers, in quality, and in equipment, the British waited with quiet confidence for the campaign of 1916. This page was last edited on 2 September 2018, at 21:45.